I can't say I've ever used anything other than common sense most of the time when it comes to selecting suitably stable material for cabinet work. There are occasions, however, when a little more information is helpful and a moisture meter can alleviate some of the guesswork. The Tramex MRH III is a multifunction unit that records relative humidity - RH - and moisture content - MC - in a range of materials. 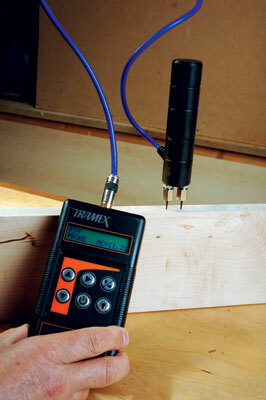 For the woodworker there are two options for obtaining readings: surface reading - non-destructive - and pin probe. Two hard metal probes need to be pushed into the material leaving behind a couple of pin prick marks. This type of reading is ideal for raw material, perhaps timber stored in a stack prior to moving indoors. You might also be interested to know the MC of existing material in a location to which you are adding new items. Two rubber pads - electrodes - are located on the underneath of the device and assess the moisture content by measuring the electrical impedance between them. There are no physical signs of a reading having been taken so ideal for stock that has been prepared to size or installed. The depth of reading will penetrate to around 30mm so thinner stock should not be resting on a different material. To assess the moisture content in a timber sample it is necessary to input a specific gravity - SG - value for the species being tested. A list of these is printed in the booklet but is not exhaustive and users may wish to extend the list from tables available online or from your timber supplier. A backlit LCD screen displays the mode of use and the values recorded. The instruction booklet is informative and easy to follow, with sufficient instructions to get you started; I recommend you condense the information thoroughly before attempting to gain any useful data. The information displays instantly so checking many boards is no hardship. This device is very easy to use. The readings corresponded to similar devices that we have in the workshop and therefore should be accepted as relative and not actual. This unit will cover a lot more besides recording MC in timber and has great appeal to anyone operating in a building environment. Once you have a device, learn how to use it and stick with it.